A few weeks ago, I was in the middle of my normal morning routine when I suddenly remembered my dream from the night before: I was driving my car when one of the tires went flat, leaving me stranded on the side of the road. The details are foggy, but as soon as I turned the key in my car’s ignition that morning, the memory of the stressful dream abruptly returned. I shook off the anxiety and registered relief– it was only a dream! Well, guess what happened on the way to work. I hit a horrible, hidden pothole, and a moment later, my car’s “low tire pressure” alarm sounded. I couldn’t believe it was happening. But sure enough, by the time I parked my car, the back left tire was completely flat. Who knows? Maybe I’m psychic, or maybe I subconsciously cruised over the pothole because flat tires were on my mind. In any case, after a coincidence like that, it’s hard not to be intrigued by the stuff that pops up in dreamland. Dreams fascinate us because they reflect all the random little fragments that our minds collect during the day. In the dream state, our brains are like automatic story generators, spinning rambling epics from the stray threads of our thoughts, fears, and fantasies. Some people never remember their dreams; others recall vivid details. Some are plagued by nightmares, while others enjoy blissful dreamscapes of rainbows and romance. Some people keep dream journals to track themes and symbols, and many philosophers, neurologists, and psychologists have devoted their professional prowess to unlocking the secrets of the slumbering mind. With all this fixation on dreaming, it’s no surprise that human culture is packed with stories about the mysteries of our nighttime visions. Check out some of these tales for more on the peculiar power of your subconscious at work. Enter the whimsical world of dream-givers, who gather fragments from people in waking life and then spin stories to bestow on them as they sleep. The novel’s narrator discovers that she’s a gifted dream-giver but soon must delve into the underside of dreaming where nightmares are made. Director Michel Gondry is known for his fantastical films that explore the complexities of human consciousness. In The Science of Sleep, Stephane is so wrapped up in his dreams that they begin to blend into his waking life. As he explores his whimsical dreamscapes, it becomes difficult to figure out where the dreams end and reality begins. Ever since she was a kid, Janie has been able to see into other people’s dreams. She keeps her secret hidden, but soon her extraordinary power begins to impact her life in huge ways. What happens when you can watch the dreams of the people you love? Sixteen year-old Ethan keeps having the same dream about a mysterious girl—then she shows up in real life. Her name is Lena, she smells like lemon and rosemary, and she comes from a long line of magic-makers. Ethan must figure out the mystery of Lena’s peculiar lineage and his powerful connection to her before her sixteenth birthday. Maybe you believe your dreams are packed with hidden meanings, or maybe you think they’re just random, nonsensical movie reels of the subconscious mind. Either way, if you’re compelled to become a dream detective, there are plenty of guides to dream interpretation & symbolism available at the library. Sweet dreams! Posted on June 28, 2012 by Corey W.
We all know that feeling—you’re in the darkest depths of the library, not a computer in sight, and you forgot to write down the number for the book you want. You try to find it on the library website but your phone’s browser makes the website look more like a Jackson Pollack painting than a website and your internet is slow enough to be painting one. Thankfully there is now one quick, easy solution to all of your problems: the Library App, now available from your iPhone or Android’s app store. You will not be sorry for the download: the app contains everything you could want for a visit to the library into a simple, linear display with no unnecessary bells or whistles. This ease of accessibility makes it an infinitely useless tool to use when you’re scrambling to hold on to books you already have, find a new book, and use your phone (as I was the other day when I discovered thanks to the app that someone had checked an extremely obscure book out that as of only two hours earlier been available—but that’s another post for another day). The app has seven feature categories (Catalog, My Account, eCLP, Hours and Locations, Ask a librarian, Events, and BookLook) and two social networking links (Facebook and Twitter). Each of the seven features is both extremely useful and well designed, continuing the theme of simplicity through all aspects of the app. One thing I was concerned about was whether or not the My Account feature would remain signed into your account even after you haven’t used it in a while; however, so far, it seems like it does indeed remain signed in. The eCLP feature lets you download eBooks and eAudioBooks directly to your phone, removing the potential hassle of transferring from your computer to your phone if you are an on-the-go reader. Hours and Locations not only tells you where libraries are or when they open, but when you open the feature it sorts the list of libraries by closeness to your current location by using your phone’s GPS (strangely enough, and one of the few problems I have with the app, is that the Events category does not also sort the libraries by relative closeness). Finally, a very welcome feature is the BookLook scanner: suppose you are in a bookstore and have a very expensive book. You don’t want to pay so much and want to see if the library has it. Instead of fumbling around with the library mobile website, just open the BookLook feature and the app will use your phone’s camera to scan the ISBN number of the book and then look it up on the catalog. This feature in particular is very welcome and extremely useful. 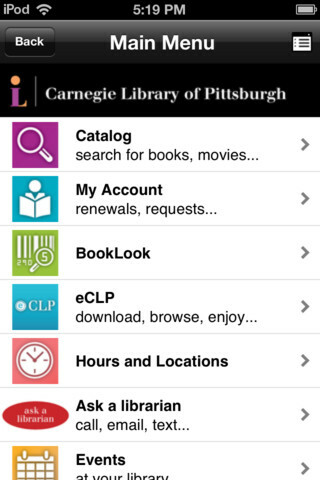 So, the Carnegie Library of Pittsburgh’s fulfills all your library needs in one small and simple app (only 2.01 MB if you are concerned about phone space). It is certainly worthy of the five star rating it currently maintains on both the Android app store and iTunes. 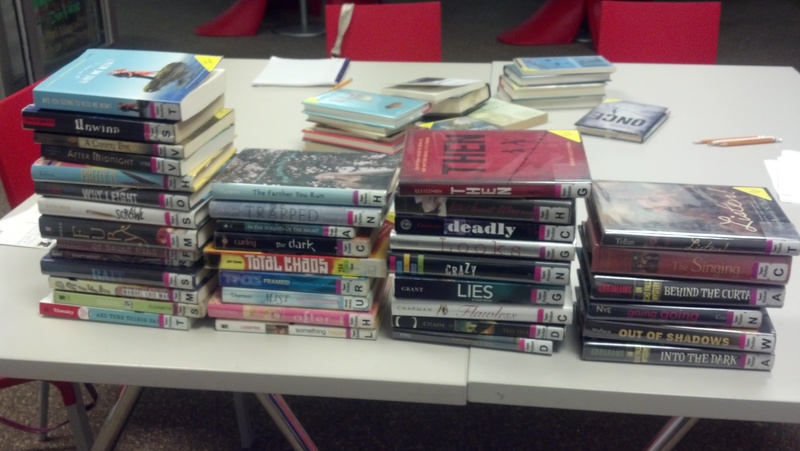 Order makes libraries run smoothly. Thanks to classification systems like the Library of Congress, we can ensure that books are on the shelves exactly where you expect them to be, in addition to being as browseable as possible. Outside of the library shelves, however, sometimes we like to add a little bit of art to the way we organize the books. The other week, the CLP – Main Teen Poetry Workshop grabbed items from the shelves and configured their spines to make a poem. and then things fall apart. While I guess we could have assigned stanza and line numbers to the catalog, a volunteer did put them back on the shelves. But if you happen to create art out of the chaos–or out of the order–of your own bookshelves, why not take a picture and post it in the comments? I grew up in a tiny town in the corn belt where the first kid to ride his tractor to school was not the last. We swam in ponds as often as in pools. The super-spacious Midwestern sprawl and lack of public transport meant that, once I learned to drive, I usually got where I was going with the windows down at…um…a totally legal and safe speed. That car now is scrap metal, and as summer activities go, Pittsburgh beats the flatlands with no contest! But gorgeous summer afternoons, grilling with friends, cinema in the park and some of the most ridiculous jams from the 90’s have the power to send me back to my neighborhood with force. These books do the same, and it’s kinda nice! In 1984, the author set out to photograph everyone in his hometown of Oxford, Iowa, instructing them to “come as you are.” Twenty years later, Feldstein hunted down the same people who had stood in front of his lens the first go-around and published the photographs side-by-side. Each set of photos comes with a brief interview of the participant, and they range from downright wacky to mundane. I’ve never thought of small town life as stunning, but this series of portraits absolutely changed my mind. Joey was 16 when his mother tragically died and he was shipped from Chicago to rural Iowa to live with a father he barely knew. Living with a near-stranger is hard, but finding out the stink in your shack comes from the graves your dad is robbing? Arguably worse. This takes the small (and big) town mantra “nothing ever HAPPENS around here!” and runs it through the wringer. This book is not for the weak of stomach, but if you enjoy a thoughtfully dark read, you will get what you came for with Rotters. Need to get out of the city – if only for a little while? Check out some of these other awesome reads with rural settings. Posted on June 26, 2012 by Abby H.
I know, I know. I wrote about movies last time, but I really must do so again because some movies are so bad, they’re good. At least, that is what I’ve always felt. If you were to take a look at my list of personal favorites, you’d probably find that it looks astonishingly like a film critic’s list of the worst movies ever made. But to me, that’s the fun. I revel in the awkward dialogue, embarrassing acting, cheesy special effects, absurd plot, and hideous make up and costuming. Maybe I like rooting for the underdog… or more likely, I just have bad taste. For those of you with bad taste like me, beginning Friday, June 29, we’ll be showcasing the worst of the worst in the Teen Meeting Room at Main every Friday at 3 pm. Due to licensing restrictions, I can’t tell you guys what our first film showing will be, but I can tell you that it will be EXCELLENT! Join us and other like minded teens every Friday to indulge your snarky side and savor those films that everyone loves to hate! Posted on June 25, 2012 by Corey W.
Many of my favorite writers, directors, and comic book creators have been inspired by the work of cult horror writer H.P. Lovecraft. Lovecraft’s stories of cosmic horror appeared mostly in pulp magazines trafficking in weird fiction throughout the 20s and 30s. Lovecraft’s Cthulhu Mythos (the fictional universe of his work) centers around the fictional city of Arkham, Mass. and its inhabitants who are most commonly on the verge of being driven mad by forbidden knowledge of the dread “great old ones”–cosmic beings whose existence and motives lie far outside the understanding of mankind. Though Lovecraft’s work wasn’t very popular during his lifetime, his legacy has spread across the dark corners of pop culture thanks to writers like Stephen King, Neil Gaiman, and Mike Mignola (artist/writer Hellboy) who all cite Lovecraft as a strong influence. His influence is also easy to spot in video games (Dead Space, Alone in the Dark), film (Re-Animator, Evil Dead II), and the web, like YouTube where I found a lot of cool videos inspired by Lovecraft and his Mythos. Nowadays you can purchase a plush Cthulhu along with role-playing games like Arkham Horror and Call of Cthulhu on ThinkGeek.com. I started reading Lovecraft after Mike Mignola’s Hellboy led me to another great weird fiction writer: Manly Wade Wellman. Now I’m deeply invested not only in the RPG Arkham Horror, but one of the expansion packs as well. How did this happen? This weird fiction stuff is addictive and engrossing. So, if you’re a fan of vociferous authors writing about life’s futility and horror on the cosmic scale then you should try Lovecraft. The Call of Cthulhu and Other Weird Stories by H.P. Lovecraft – A great intro to the dark world of Lovecraft. The Call of Cthulhu includes the popular stories “Rats in the Walls,” “Herbert West Reanimator”, and “The Haunter of the Dark” and “Pickman’s Model” the basis for an episode of Rod Serling’s Night Gallery. At the Mountains of Madness by H.P. Lovecraft – is probably Lovecraft’s most popular and well-known work. A novella written in February/March of 1931, At the Mountains of Madness was rejected that year by pulp magazine Weird Tales editor Farnsworth Wright on the grounds of its length. The story chronicles the Antarctic expedition of professor William Dyer and the strange remains he uncovered in the frozen wasteland. Hellboy by Mike Mignola – And don’t forget Hellboy! He’s a protagonist trying to cope with the cosmic-scale Lovecraftian insanity of his life. Summoned by Rasputin and a bunch of Nazis in the 1930s, Hellboy was raised by the Allies and a professor of the occult. He used to investigate the unexplained and supernatural for the Bureau of Paranormal Research and Defense (B.P.R.D. ), but now fate has led him to embark on a hero’s journey. Any questions? You could say say that all of this Lovecraft stuff is kind of gruesome and morbid, and I’d say you’re right. Isn’t it wonderful? Perfect Picks by the Poolside… or in the Pool? One of the most relaxing places I would love to find myself, would be the beach. But since this will be one of the few summers I won’t be able to make it to the beach, the local pools will have to suffice. Whether I managed to get a tan remains to be seen. Most of the time, I burn, lather up with Aloe and just go right back to the color I started out with. However, neither of those things will stop me from enjoying the summertime entertainments and of course, a few great books. So check it out: you’ve got your choice of a few hot reads and a chance to get some poolside action! Nancy Kinton, an heiress fleeing an arranged marriage, and Minerva Sharpe, a runaway plantation slave, both fine unlikely salvation on the pirate ship Deliverance. Life as a pirate is difficult enough, but can the two young women escape the cruel Captain Bartholome, who has pledged to follow them over the seven seas? And will Nancy’s long-lost friend, a sailor in the Royal Navy, love the pirate she has become? Matt Gratton and his two best friends, Sean and Coop, always set themselves a summertime goal. This year’s? To see a real-live naked girl for the first time. As far as Matt is concerned, they’d have better luck finding the lost city of Atlantis. But seeing a girl in the buff starts to seem like child’s play compared to the other summertime goal Matt sets for himself: to swim the 100-yard butterfly (the hardest stroke known to God or man) in order to impress Kelly West, the hot new girl. So what if he can’t manage a single lap, let alone four? He’s got the whole summer to perfect his technique. What could possibly go wrong? Every year the camp and its familiar routines, landmarks, and people have welcomed her back like a long-lost family member. But this year she is returning not as a camper, but as a counselor, while her best friend, Katie Bell remains behind. All too quickly, Helena discovers that the innocent world of campfires, singalongs, and field days have been pushed aside for late night pranks on the boys’ camp, skinny dipping in the lake, and stolen kisses in the hayloft. As she struggles to define herself in this new world, Helena begins to lose sight of what made camp special and the friendships that have sustained her for so many years. And when Ransome, her longtime crush, becomes a romantic reality, life gets even more confusing.